Although, they are many tools on the Web, Blogger and WordPress are the prominent tools to create blog on the Web. One can create its Premium site on these tools. We have also discussed few things and steps to create and map Premium Domain with blogger.com and upgrade your sub-domain on WordPress.com. to Premium domain. Also Read: How to Map your Blogspot blog with Premium Domain. But, right now, we would like to discuss the limitations and benefits one can get on using its Premium Domain on Blogger.com or Upgrading sub-domain to Premium Domain on WordPress.com. There are the few point which we have analyzed and liked to blog so that you ponder before taking any decision. - This might be the first thought comes in mind before buying anything- What the price of getting Premium Domain? We give the brief idea of both plans provided by Blogger.com and WordPress.com. Blogger.com: This is the service of Google Inc. Hence, they also provide upgradation plan of Rs.150/month with addition of other tools like any other web hosting company. But, you have other choices too. You can buy a domain at $10-$15/year from 3rd party like Godaddy, Namecheap, 1on1, No-IP and map your domain with blogspot sub-domain and create full fledged site. 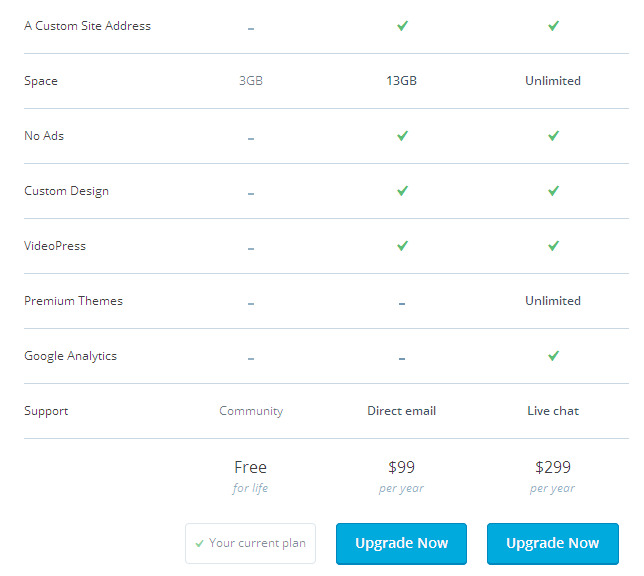 WordPress.com: It only provides upgradation plan in which one can convert its sub-domain to Premium Domain in just $18/year and also allows to unlock various tools. Although, they provide few limitation in this and offers 3 different plan which one can choose (as shown in the below image). How much Storage and Bandwidth will you get while spending few bucks? According to Blogger.com terms and condition, 1GB image storage from Picassa tool of Google you get, but with Unlimited Bandwidth. While, you can write unlimited text articles and 300 labels can be added to them. For WordPress.com, It divides its plan in 3 structure- Free, Premium and Business plan. In Free plan, 3GB storage and free blog themes better than blogger.com provides. In Premium plan, 13Gb storage and VideoPress tool and No Ads from WordAds. But, Business plan ($299/year) gives you the costly deal of Unlimited storage and bandwidth. Security is important to protect your blog hacking or blocking. Blogger.com and WordPress.com may give an advantage over the Self-hosted WordPress site which anytime can be hacked, if not maintained or Security plugins are not installed. We have also encountered the same thing and one has to use various WordPress.org providing free plugins to encounter this mess. Whereas, Blogger.com and WordPress.com can be trusted in this regard. But, there is also crack in this. If you violate the Blogger or WordPress policy, they may shut down your blog. And, WordPress does not provide any warning. This is not the case with self-hosted WordPress site. You are the owner and you are the content manager and you will have your own policies. Search Engine Optimization is also an important aspects. That's why in previous blog we have written the various aspects on this and why it is necessary to run a Premium Domain blog. Also Read: Why a Premium Domain is necessary for better SEO. If you are mapping your sub-domain to Premium Domain, you no need to worry about SEO effects. As, it effectively maps your free domain to Premium domain and you can write further your blog without worrying about. Search Engines will take care of it automatically. You also need to re-submit your URL as Search Engines will be redirected to your new URL whenever they crawl your previously submit URL. But, it slightly affects when you transfer your domain to self-hosted WordPress blog, where you take care that your Permalinks is not changed, otherwise SEO and your site result in Search engines will be drastically affected and you will start from the scratch. If you are trying both Blogger.com and WordPress.com, you know the answer which provides better plugins and tools to your blog. WordPress has plenty of useful and required plugins which can be used to modify and publicize your blog. You can also auto-share your blog content to various social networking sites. And, also gives more tools to write blog content. In this, blogger.com lacks a lot. But, if you are only concentrating to write a useful and simple text blog post. Then, it does not matter which blogging platform you are using. WordPress.com provides plenty of Blogging and Professional site themes. And, also plenty of premium themes available for it. But, it does not allow third party theme for its free version. Whereas, Blogger platform allows you upload any .xml extension file and you can also customize your blog too. This parameter can affect a lot in deciding the better platform of blogging for you. If you planning to earning, Google Adsense can be the best choice where you can earn depending on your blog visitors. But, do not forget that Google Adsense policies are stern for its publishers. So, write carefully and get accepted. Whereas, for WordPress, you can't use Google Adsense. If you are spending $300/year for its premium plan, it allows you to use third party Ad network. Otherwise, there WordAds network for WordPress free blog users. If you are planning to use any of these blogging platform, i would say use blogger.com for free. If you have few bucks to spend and then, start, the best option, then, is buy Web hosting plan with premium domain, install WordPress tool for your blog. This site will be under full control of yours whose policy writer, content writer and owner will be you. You can blog and use multiple free plugins and themes on WordPress and easily customize your site or blog. Also Read: Easy way to Auto-share Blogspot Blog on Social Sites. Comments "Compare Features of Premium domain on Blogger.com and Wordpress.com"